Someone in my family has taken an interest in…wait for it…blacksmithing. 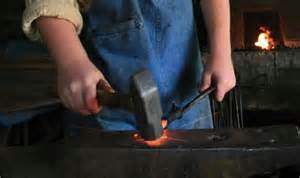 Thanks to a few family members and local blacksmiths--generous with their time, knowledge and equipment—we have a forge, anvil, tongs, mallets (or are they hammers? ), and any number of items necessary to heat and mold metal. The temperature in my non-air conditioned shed has gone way up just as the hottest part of summer approaches. The metaphors to the Christian life are nearly endless. We’ve read some beautiful ones right here this week. The lesson in faith I am learning, though, has very little to do with the mechanics of forging metal, and very much to do with the mechanics of growing up. We are working to expose our boys to as much of what’s-out-there-in-the-world as we can to help them become well-rounded men of God (I’m sure they feel a little overwhelmed at times). So far, I have learned that even if we should miss some critical cultural exposure (heaven forbid! ), somehow, some way, God will work what is needed into their lives in spite of us. I’m learning to sit back and watch instead of jump up and do. It’s a lesson of faith versus control, forged in the heat of parenthood. It’s not my job to force or forge my sons into godly men. It is my job to lead them to Jesus and help them fall in love with Him. In my humanness I would use the exact wrong amounts of heat and force. Their Heavenly Father will do a much better job of molding and making them into masterpieces. So, despite the soaring heat in the shed I am watching The Master lead my son to Himself, and to himself. I can’t think of a better use of a summer.